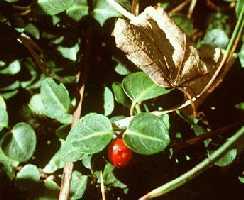 Partridgeberry (squawvine) is Noon kie oo nah yeah in Mohawk. I've been unable to find any other Indian names for it, although it was apparently widely used as a womens' medicine among eastern tribes. But the vine doeesn't grow around here. In spring -- April to June -- the evergreen vine flowers with these fragrant white trumpet-shaped 4-petaled flowers. The vine grows about 6 to 12" high, creeping through moss around old tree stumps. The leaves are thick, very shiny, heart-shaped in opposite pairs. In the fall, berries form and become bright scarlet. Scarlet frunits remain on the vine all winter if not eaten by birds and deer. The berries are tasteless but occasionally were useful as emergency food. 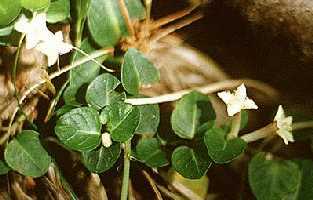 The scientific name of this plant is Mitchella repens. Where it is used to promote easy childbirth, a tea of the leaves is taken only during the last few weeks. It should be noted that one of the Iroquois medical uses for this vine was as an abortifacient. There was no record in the Phytochemicals database of any chemicals analysis for this plant, despite its widely-reported usage in women's medicine. Apparently no investigations have been done about its widely-observed practical ability (prepared properly and taken for the last few weeks before childbirth) to promote easy childbirth. One of the things that is noticeable about the ethnobotany database mayterials is that most of the ethnobotanists have been men. But among woodland peoples, most of the practicasl herbal medical knowledge is women's, and a great deal of it is specifically women's medicines. Years ago (and now) knowledgeable women do not like to talk to any men about it. Mitchella was in widespread early use by white women settlers, and was adopted (late) in the U.S. National Formulary in 1927. It was dropped in 1947, as the grow6th of hi-tech, hi-cost hospital childbirth began to be encouraged in the medical industry, along with the growth of health insurance to pay for it. CREDITS: The photo is from the University of Wisconsin (Madison) botany gopher.